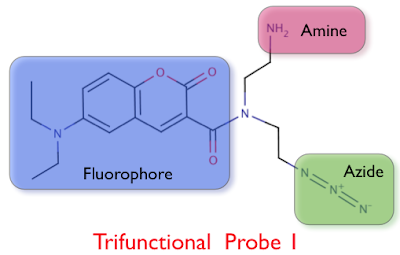 The molecules identified by forward chemical genetic screens can be powerful probes of biological processes, but their utility can be hampered by the technical challenges of target identification. Historically, both genetic and biochemical strategies have been utilized for target identification. The genetic approach is to identify and characterize drug-resistant mutants. This approach is simple and general in scope, but typically limited to model systems and does not always succeed. The biochemical approach usually involves isolating proteins that directly bind the molecule of interest. This strategy usually requires knowledge of structure-activity relationships (SAR) so that suitable locations for the attachment of labels or linkers are known. The biochemical approach is a general one, but can be difficult for membrane and low abundance proteins. Challenges in applying the biochemical approach include the SAR studies and chemical syntheses required. New "tagged" libraries have been synthesized around templates that facilitate biochemical target identification experiments and bypass the need for SAR studies. The Cutler lab has two general target identification projects underway. A drug-resistance screening pipeline has been established and utilized in screens for resistance to 33 bioactive compounds. 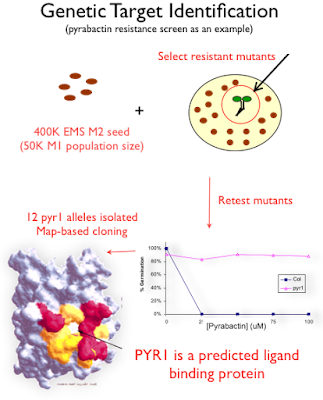 This approach led to the successful identification of PYR1, the target of a new agonist of the ABA signaling pathway called pyrabactin. Mutations conferring resistance to 19 additional chemicals from our small molecule screens have been isolated, utilizing resistance screens. Positional cloning is being used to identify loci. Additionally, deep sequencing (2 alleles for each resistance locus) will be combined with mapping data to expedite cloning. As a complementary strategy, tagged libraries designed to facilitate biochemical target identification and in vivo imaging are being synthesized using click chemistry and a collection of ~4000 clickable building blocks. To date, ~11K tagged compounds have been screened for phenotypes in Arabidopsis by Andrew Defries, a graduate student in the Cutler lab. Andrew is characterizing his hits using using chemical, genetic and biochemical approaches. This post will be updated with more details, eventually. Although arabidopsis is a wonderful model system, but I guess it is hard to screen the whole mutants library for target identification. Since some of you compounds can inhibit the growth of the yeast, did you try identify the target in yeast first, then confirm them in arabidopsis. You know that you can easily screen the whole deletion mutants and overexpression library with microarray or even liquid assay or agar assay. The tools in yeast are indeed awe inspiring. When appropriate, we will use yeast. My main concern though, is target conservation. We have seen many cases where structure-activity-relationships do not match up across kingdoms, and a small number of cases where they do match up (suggesting, but in no way proving, a potentially conserved target site). In general, I am not too optimistic about the odds that synthetic compounds from our libraries will share conserved mechanisms across such large evolutionary distances. I think for natural products, where natural selection has presumably played a role in shaping the target site interactions- it makes a lot of sense biologically that targets would be conserved for hits that are active across kingdoms. But, for synthetic compounds, it is a craps shoot. Nonetheless, there are ways to exploit yeast for target studies: yeast three hybrid, over-expression of plant target genes to mop up the drug and lessen toxicity in yeast, and others. Thanks for the comment.